This now allows us to look at patterns. If we start with the initial letters of the 64 items, we see that the overwhelming majority (40, or 70%) begin with EVA sign o. A substantial proportion begin with EVA ot (16 = 25%) or with EVA ok (12 = 19%). The full table is here. Below the table I start to consider what this might imply about the meaning of the Voynich names. What can we make of these statistics concerning the Voynich labels? It is useful at this point to take into account research into how the names of stars originated, were transmitted and were altered, from earliest times to the 15th century, in Europe and beyond. A significant expert in the field is Paul Kunitzsch, some of whose works you can see here, and in the discussion which follows I will refer mainly to P. Kunitzsch, T. Smart: A Dictionary of Modern Star Names (Sky Publishing Corporation. 2006). “[In Spain] primarily, in the 10th to 13th centuries, works on sci-A astronomy, astrology, and instruments, including theAlmagest (as well as books on alchemy, mathematics, medicine, and all else), were translated into Medieval Latin or Old Spanish. This will become important at later stages when we start to try to identify the star names (a process which others on these pages have begin already). There is a huge amount of variation in how the star names are written and transmitted. If the author of the Voynich manuscript borrowed any names at all, which seem highly likely, we should therefore expect to see that variation making its way into Voynich star names also. 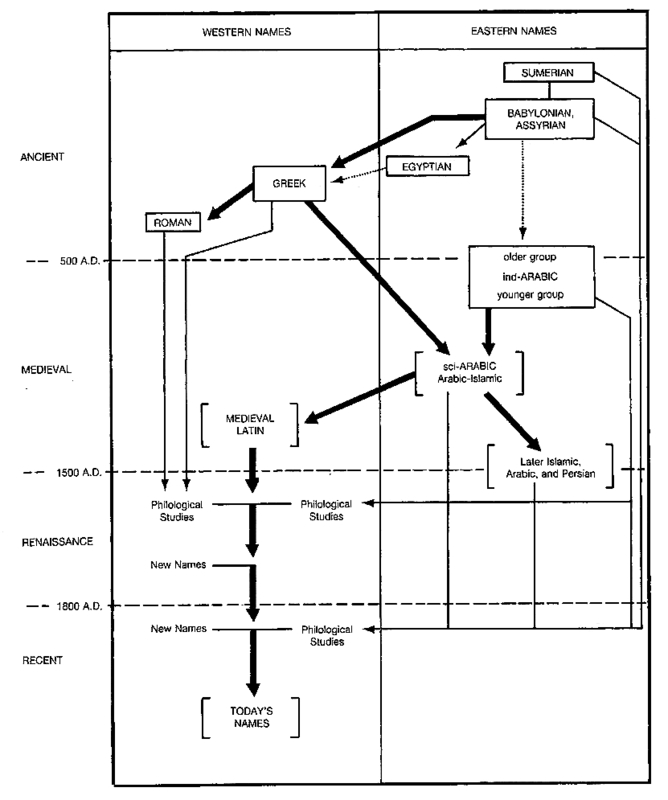 Kunitzsch and Smart (2006), and Kunitzsch also in other of his works, offer a coherent and authoritative guide to the ways in which star names were transmitted from ancient times, and they summarise it in this diagram. The key time period to look at in respect of the Voynich manuscript is from around 500 AD. The key point they make is that from around 500 AD onwards in Europe, the influence of Arab writers, drawing of course on Greek, Babylonian and others, was enormous. AFTER 1500, European scholars rediscovered ancient sources directly, but BEFORE 1500 all mediaeval European star naming practices were filtered through from Arab sources. A further point which can be deduced from Kunitzsch and Smart’s analysis is that there was NO OTHER source of star names of any influence at all at that time in Europe and the Near East. Furthermore there are no known independent traditions of star naming, i.e. any which did not draw on Arab sources. This is important because if the Voynich manuscript was created in Europe or the Near East, as seems likely (see discussion here), then at that time and place there was no star naming tradition available to the authors except the one derived from the Arabs. Also, it is highly unlikely that the Voynich authors could or would have evolved their own name for the stars independently of the Arabic tradition, since so much of the manuscript obviously follows European thinking. The upshot of this to my mind is that, given this evidence of the Arab influence on star naming at the time, and the statistics I have set out above, the initial letter EVA ‘o’ must be analysed as an /a/ sound, which matches what I have already argued in previous analyses (see my Feb 2014 paper). The reason for this is the influence of the Arabic definite article /al/ which is present in significant numbers of Arabic star names (see a list here). In the case of many Arabic star names the /l/ sound is elided into the following letter, depending on whether that following letter is a ‘sun’ or a ‘moon’ letter (see explanation here). A good example is Al Debaran, which was frequently elided into Adebaran because the letter ‘d’ is a sun letter. However, in many others the full Arabic definite article /al/ remains even today. The second conclusion to be drawn from this is that the cluster transcribed in EVA as ‘ot’ cannot be interpreted in any other way than as representing in some way the full Arabic definite article /al/ , giving a reading to the EVA ‘t’ the sound of /l/, in some form. To my mind this is pretty incontrovertible. I cannot see any other way to explain the statistically high number of initial EVA ‘ot’ clusters at the start of the star labels we have identified, given the history of star naming in Europe and the Near East at the time the Voynich manuscript was written. 1. Voynichese star names beginning with EVA-O generally come from Arabic ones beginning with /al/. 2. The full original sound /al/ is preserved in that form and represented by two letters in Voynichese names beginning with EVA-OT, while Voynichese names with different second letters represent altered forms without that distinct /L/. A. Some should preserve the original /L/ sound as the second letter. B. The letter which does so should be the most common second letter (or at least the most common one for which no other sound is yet established). The sound /L/ could be implied by EVA-O. It could be implied by the following letter under the given circumstances (and that rule could apply to some of the following letters and not others) or by certain two-letter sequences. It could be reduced to an unmarked secondary lateralizing effect on the sounds before or after its original position, not considered a separate sound needing a separate letter by Voynichese speakers (just as English speakers don’t think of the aspiration on an aspirated plosive as a separate sound needing a separate letter). It could have been prone to consonant order reversal with the following consonant and ended up as the third sound of the word. It could have been absent or disappeared entirely, either from the whole language that imported these names, or from certain within-word positions in that language, such as “after a vowel” or “before a velar consonant”. It could have been retained but shifted to some other sounds which are either implied or spelled with letters whose sounds are not /L/ (note, for example the lack of established letters for /d/ or /ŋ/ or /m/ so far). And that’s just for premise “A”. Even if we accept premise “A” as true, so that there will be a letter for /L/ as the second letter of some EVA-O star names, we are still left with no basis for “B”: no way to predict how many words with /L/ as the second letter there should be, and thus which second letter it is, especially given how close the numbers are for the two most common second letters. The numbers alone hardly distinguish those two at all, so that if EVA-T had been assigned another sound first and EVA-K were still considered unknown, then the same logic would now tell us that EVA-K’s sound should be /L/. (It would just need one more sentence, explaining that it can’t be the most common second letter simply because we already had a sound for that, but the second is so close it doesn’t matter.) We also already know that there must have been other possible outcomes for such words because there are other second letters for EVA-O star names, but what we don’t have, without knowing what those other processes were, is a way to rank them in order of likelihood or commonness. This is not to refute the idea that EVA-T could be /L/, but to refute the idea that there are no viable alternative explanations. I don’t even need to show which alternative is the best, in order to show that they exist and have not been eliminated by these numbers. If these numbers alone say anything to me, it’s that no single letter is common enough as the second letter after EVA-O in Voynichese star names to be a very likely letter for /L/; if it’s there and gets preserved at all, it should be in closer to all of the names, not just 25% or less. Losing so many /L/ sounds by attrition, to one phonetic change in one case and another one in another case and so on, while still having preservation of /L/ as just barely more common than other outcomes (why not less common than some? ), is more difficult to imagine & accept than a single dominant phenomenon accounting for all or nearly all of them (such as that it’s simply always lost, or present but implied without its own separate letter). Mister Occam would not approve. Hi Derek, you are quite right in your conclusion. Whether of not EVA “ot” represents Arabic “al”, it isn’t safe to make that identification. Any further work built upon it would be open to challenge of this fact. Your point is valid, and echoes that made by Marco when I first sketched out these ideas (see my page on Eva:ot, with some initial responses). Maybe the best thing is to devote a whole posting to it, so I’ll work on it……. The problem with this conclusion is that the number of star names beginning with EVA “ot” is not really that much higher than those beginning with EVA “ok”: 16 for “ot” and 12 for “ok”. If we take EVA “ot” as “al”, and so EVA “t” as “l”, we have to ask what the relationship between EVA “ot” and “ok” is. I understand that from your other identifications you believe EVA “k” to be a sound roughly equivalent to “k”. You mention in this post that in Arabic the second sound of “al” is elided and assimilates to the following consonant. Yet of the sounds in Arabic which could be EVA “k”–Arabic ha and kaf, maybe qaf and ghayn too–none of these elide with “al” in that way. So the star names beginning with EVA “ok” either do not begin with Arabic “al” or have altered in a way not normally found in Arabic. My thoughts are also drawn to the problem of having EVA “k” and “t” with such different phonological values. They are clearly very similar characters in appearance, and occur in words in the same places. Yet the sounds “k” and “l” are no more similar than any two consonants. I do not wish to labour this second point, however. I hope my comments are helpful and constructive, even if unsupportive of your conclusion. Being “altered in a way not normally found in Arabic” isn’t a big deal when the language in which the alteration happened might not have been Arabic. Different languages play by different rules. And a name that’s been dragged from one language to another more than one time could have been subjected to several different rulebooks, and then the effects depend on what order they went in and in what era of each language’s history. But, of course, that no only counters the idea that Voynichese /ak/ shouldn’t have come from Arabic /alk/ or /alq/ or /al’/ or such, but also counters the idea that we can say that Arabic /al/ is preserved in original form in one Voynichese letter pair while others represent only altered forms. To predict the fates of Arabic /al/ in that much detail would require first knowing what specific phonetic trends apply in the given language, which, with Voynichese, we don’t; that’s the stuff that we’re still trying to figure out. What’s really needed for this kind of comparison is not just percentages of star & constellation names starting with “al” and EVA-O in Arabic and Voynichese, but percentages of such names starting with all derivatives from “al” in the various languages that they’ve been dragged through. Only then might we get a picture of whether the expected amount of “al”-based names is closest to the observed amount of Voynichese “ot” names alone, “ok” names alone, both put together, all “o” names together, or something else. I expect that if we had those numbers available for a list of separate languages, we’d find that they’re not consistent enough from one language to another to make such predictions at all for an unknown language, which would leave us with no basis for saying it correlates with one Voynichese letter or combination of letters but not another.